Every landscape is made up of different features such as plantings and hardscaping. In addition to that, the space may also have water features, decorative elements and fire features such as fire pits and fireplaces. These installations add warmth to the outdoor areas and make them more usable in the colder months. Fireplace design isn’t something a novice can handle and it’s important that you hire experts for the job. 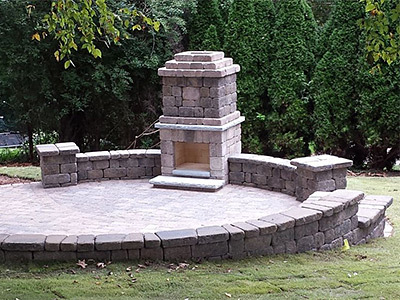 As a full-service landscaping company, we at Emerald Creek Landscapes, LLC handle fire pit and fireplace design and installation as part of many landscape projects. But we also handle these jobs as standalone projects and can install a fire pit or fireplace in existing landscapes. As a well-established company in the landscaping field and have been serving customers in Ringgold, East Brainerd, and Fort Oglethorpe. Our experts have successfully completed a large number of fire feature design and installation projects across East Ridge, Dalton, Chattanooga and Red Bank as well. We have also catered to customers in Middle Valley, Cleveland, Soddy-Daisy, Calhoun and the surrounding areas and created beautiful hardscaping elements on their properties. Stone Blocks - Many homeowners like a stone fireplace feature and want the surrounding space to be covered with stone pavers as well. These fireplaces have a classic and elegant look and blend in well with casual styled and well as formal-styled landscapes. Brick - A brick fireplace or fire pit has a very rustic and earthy look and looks great in any landscape setting. The earthy tones complement the colors of the soil, plantings, and grass and create a very pretty picture in the outdoor spaces of your home. Concrete - This is one of the most economical fire feature materials and can be used to build a custom fireplace in the design and styling you want. If you don’t particularly like the look of bare concrete, the surfaces can be clad with brick or stone veneer. The feature will have the appearance of these materials but at a much lower price. When we are handling any fireplace or fire pit design and installation job, care is taken to ensure that the best materials and workmanship are used. This enhances the appeal of the structure and adds to its longevity as well. With the vast experience and expertise we have developed over the years, we know what it takes to provide excellent solutions at very competitive fireplace installation cost.